Gutters are very important as they pass the excess water accumulated smoothly and drain it into the drainage system. Without gutters, we would have faced many difficulties mainly during the monsoon. But sometimes the gutters may lack the ability to perform the duties it should do and that is a signal that they should be replaced. It is however really difficult to imply that to say that gutter should be replaced as the process takes long steps. When the gutters give their service for many decades, slowly they are damaged and various parts of the gutter wear out. It implies that it should be replaced. Let us know about some signs that it is high time and the old gutter should be replaced with the new one. Cracks, Holes: When the gutter lasts for a long period, the gutter face water of great speed and this slowly results in wearing out of the gutter and also results in the appearance of holes and cracks. These somehow imply that the gutter is old enough and should be replaced with the new one as soon as possible for discontinuous functioning. When the gutter has few holes and cracks it is ok but the number increases rapidly, then it is a matter to worry and so it should be replaced. Screws and Nails: It can be seen that nails and screws that hold the gutter are slowly loosening themselves over the years. 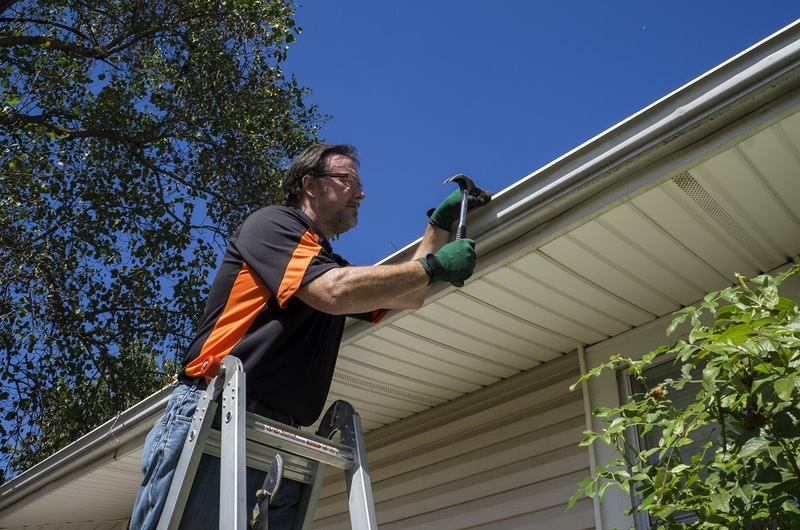 When the screw and nails finally get out then it is signaled that the old gutter cannot perform like before and it desperately needs a new one as without replacing the perfect working cannot be expected. Pulling Away: When great forces of water attack the gutter for over the years, the sides tend to get loosened and it goes away from the position and slowly slides away from the roof. It is a problem and should be solved and the solution is changing the gutter. If the gutter is replaced, then the position will be perfectly aligned and the function will be again done properly. Paints: When the paints on the exterior wall of the gutter wear out, then it denotes that the gutter has been prepared many years ago and it is high time that it should be replaced and mended. The paint should again be applied to make the gutter look good from outside. Erosion: When the erosion takes place of the gutter due to wind and water forces, the sides tend to get demolished and the overall balance of the gutter also is disrupted. So, before the whole system is damaged, it is better to mend the problem and replace the existing gutter. If the gutter is not replaced now, then when water will be accumulated it will result in chaos and will be a problem for the residents. Separated Gutters: If not replaced on time, then the gutter can get separated into different gutters and this will not help the process and the drainage system will also be affected due to this. From the above points, it is clear that the gutters should be mended and replaced as soon as it starts to tear and wear out. If we don’t perform the gutter replacement process on time, then we will not be able to experience the correct function of the gutters and the excess water may enter the house and create chaos. So, if these signs do appear in your gutter, replace it as soon as possible for a tension free life. Hugo? Nice to meet you!